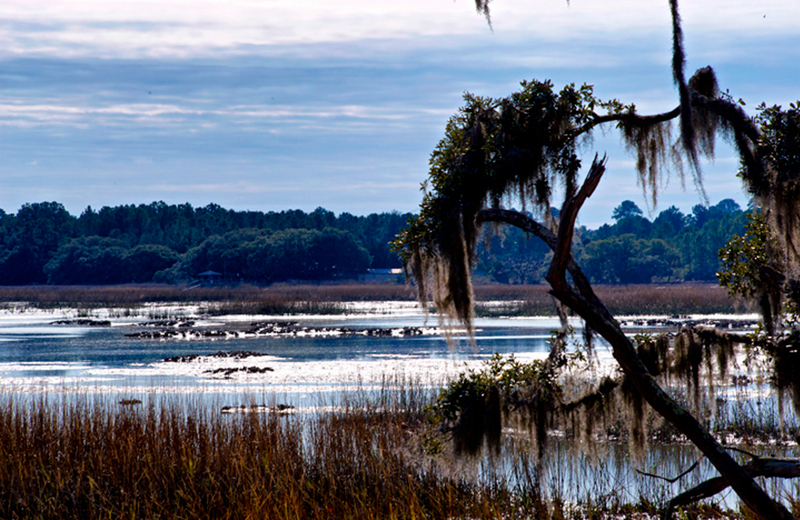 Along the coastline of South Carolina just south of Charleston sits a 550-acre tract of land that offers a cornucopia of environmentally unique habitats. 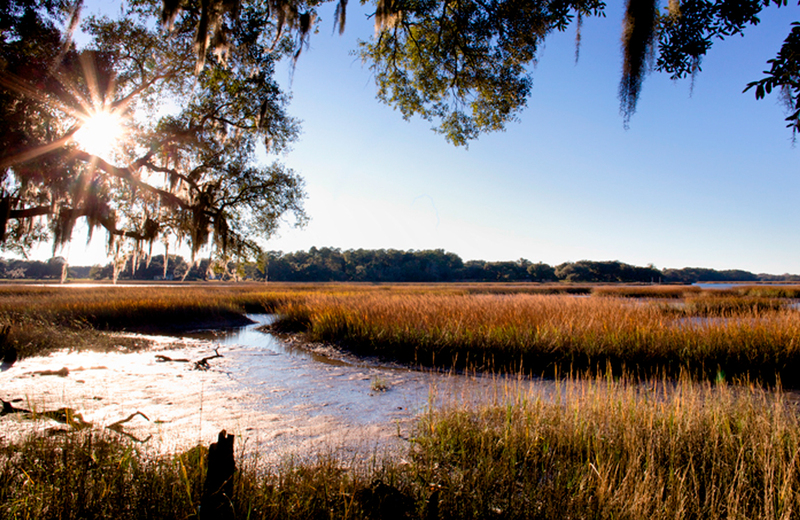 From live oak trees and hanging moss in the uplands, to tidal marshes, small islands and estuaries flowing to the ocean throughout the marshlands – the vast property is characteristically “old south.” The scenic views of the property are enjoyed by local South Carolina residents and tourists alike as its location is highly visible from an adjoining county park and the various public waterways that border the land. The area is home to a number of native and rare plant and animal species. The nature of the mature forests, wetlands, open water and adjoining fields attracts an eclectic mix of resident and migratory wildlife including birds, alligators, various fish, crabs, coyote, and white tailed deer – to name a few. And at least 164 species of trees and other plants are found throughout. The “Atlantic Flyway” – a major bird migration route – runs along the coastline of the property and accounts for the high number of bird species that inhabit the area. The redwing blackbird, great blue heron, red-tailed hawk, and the occasional bald eagle are amongst the large number of bird species that depend on the area to thrive. A local family owned the property since at least the 1800’s, running a fifth-generation farm with both aquaculture (clams and fresh water shrimp) and agriculture (beef cattle) productions. With the strong desire to pass along farm operations to the next generation, the owners were reluctant to sell off the property and farm operations to developers. However, with economic pressures and property tax burdens, the potential for a multi-million dollar payday was an enticing opportunity. The property is situated in a highly valued and sought after area along the coast where residential development has become very popular for second homes and retirement. Exploring what was best for the family, the owner contemplated selling the land for development use. The owners circulated sales literature on the property and its features and received a generous offer from a foreign development firm for the 163 acre uplands area. At a cross-roads, the owners weighed the options. Selling the land to the developer would generate needed monetary benefits for the family. It would also, however, largely destroy the still rustic area and negatively impact the surrounding community by obstructing the pristine scenery of the unique land and removing the natural habitats of various wildlife and plants. The family would also have to walk away from its farming legacy and watch as this pre-Civil War property was razed for development. Curious as to what other options existed, the family enlisted a consultant who led them to the potential conservation value of the property. Namely, various aspects of the property were deemed priority habitats under the South Carolina Department of Natural Resources Wildlife Conservation Strategy for the region, among other valuable conservation attributes. Equipped with knowledge of the potential conservation value, the family discovered they could donate a conservation easement to a land trust which would result in tax incentives under Section 170(h) of the U.S. tax code. In order to make this alternative route worthwhile for the family in the face of a hefty offer from a development firm, partnering with outside investors in the land was essential. The family formed a partnership to own the land and sold interests in the partnership to investors. The group contacted Southeast Regional Land Conservancy (SERLC), whose mission is to work with landowners to protect a conservation legacy for the future. In order for the SERLC to accept a conservation easement donation, they first needed to determine if the land was worthy of conserving, which is done through a Baseline Report documenting the property’s features and attributes prior to the donation and outlining the specific conservation values. The next step was to obtain a qualified appraisal. This involved determining the property value “before” and “after” the donation of the conservation easement. The difference between the “before” and “after” valuations determines the value of donation and the related tax incentives. The conservation easement was donated to SERLC for conservation to preserve the natural surroundings and support the areas plant and wildlife. The partnership also received tax incentives that flowed down to the investors, as well as the original family owners. Ultimately, the family paid off their mortgage and were able to keep the farm in the family for future generations. As a result of the donation, residential development is now prohibited, the public still enjoys the scenic views and many rare bird species using the Atlantic Flyway for migration continue to benefit from the conserved coastal property in South Carolina. On top of that, the original owners continue to engage in limited and environmentally neutral farming of the land and are able to carry on their family’s legacy. A unique term of the conservation easement, the family also aspires to one day use their aquaculture operation for educational purposes – opening up their beautifully conserved land for a children’s day camp.